The blade is 60" wide, approximately 21" high. I have BX25 and got a rear mount snowblower. Worked but was slow and hard to operate being rear mounted. Last year I purchased this plow and it does a fantastic job. Probably 5 times faster than snow blower and does much better job. We have some gravel and I wish I had ordered shoes for the plow. Maybe someone will by them for my next birthday. Highly recommend the product. I had a part missing when it arrived and support from BXPANDED was awesome. I have had my snowplow for a couple of years and it has worked flawlessly. We get alot of lake effect snow as well as northeasters in upstate NY. and only had to get out my truck mounted plow on a few occasions. 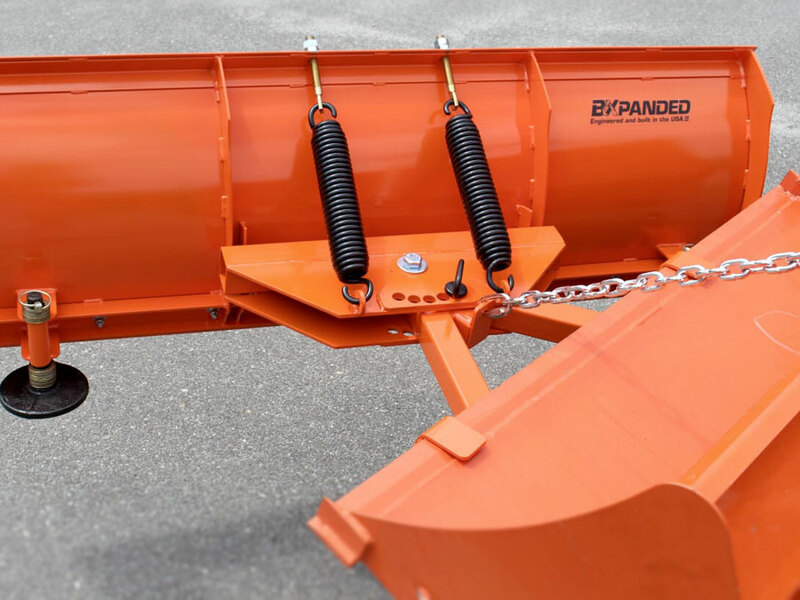 The Bxpaned plow will handle anything you throw at it! I live in the Colorado Rockies and I have a long driveway. I've always had problems getting the heavy snow far enough off the driveway! This Blade makes plowing so much easier! Thanks Guys !!!! Finally used snowplow during freak northeaster in ct. Very easy to hook up. Just had to change chainbinder bolt location in achieve correct tension. Worked great! I also opted for the AR400 cutting edge and skid shoes. Well worth the money. Came UPS to my door. Easy to assemble. Very satisfied. P.S.&return&≠wline&I have now plowed about 4 feet of snow in 5 storms (heckofa start to the winter here!!) , some wet, some dry and I like the plow even more each time. After using a heavy makeshift plow from a Jeep on my BX23 previously, this plow is a dream to use. I have a gravel driveway and it will scrape it down really well. With the skid shoes I can plow a path across my lawn without damaging it.&return&≠wline&&return&≠wline&I had a couple of questions when I first received it because my bucket had some modifications (bucket hooks) and I needed to figure out how to mount it. I received terrific support by email and telephone. 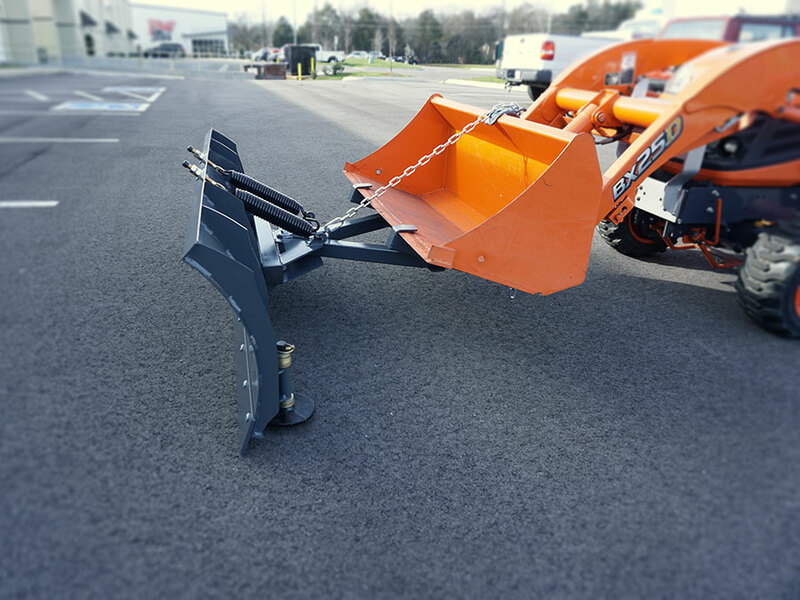 An unmodified bucket will have no trouble with this plow. &return&≠wline&&return&≠wline&The plow's assembly was simple and I had it from box to on the tractor in just a few minutes. It was delivered really quickly, too.&return&≠wline&&return&≠wline&Bottom line: BUY THIS PLOW! :) The product and (pre- and post-sales) support are great. Received my 60” plow a week from purchase time and put it together on th garage floor right away. Solidly built for sure! First storm was a nasty 6” followed by 8 hours of freezing rain then rain. End result was like concrete and a deep freeze was coming! In short, the plow handled the heavy snow/slush just fine. Mind you I was plowing in the dark so that made things worse as there were trees hanging over the driveway that I had to push through while feeling out the new plow. I cleared that mess and had to widen the drive with my loader the next day as the windrows made by the plow were freezing hard as a rock. Next storm was powder and it was fun and amazing how well the plow worked. I wished I had bought one years ago! Bring it on, ol Man winter! I just traded in my BX24 for a B I kept the plow, the lights, the bucket hooks , thumb, tool case everything made BYBXpanded. Great stuff outlasted my tractor and be as good as new on the new B! I was pleasantly surprised at how well built this is for the price. It assembled easily. I was at first sceptical of how well a "chained on" blade would perform. After the first pass I was amazed at the ease of operation, the ability to lower one edge or the other, and how solidly it stayed attached. This has got to be the best purchase I've made for my BX25D. I can heartily recommend this blade to all who consider buying it. I just received my snow plow yesterday, Saturday, it was a couple days early, which was great. Today I assembled and installed it on my BX2660 Kubota tractor. I can only review the assembly and installation as it has not snowed yet. The plow and frame seem really sturdy and well designed. It is very heavy! 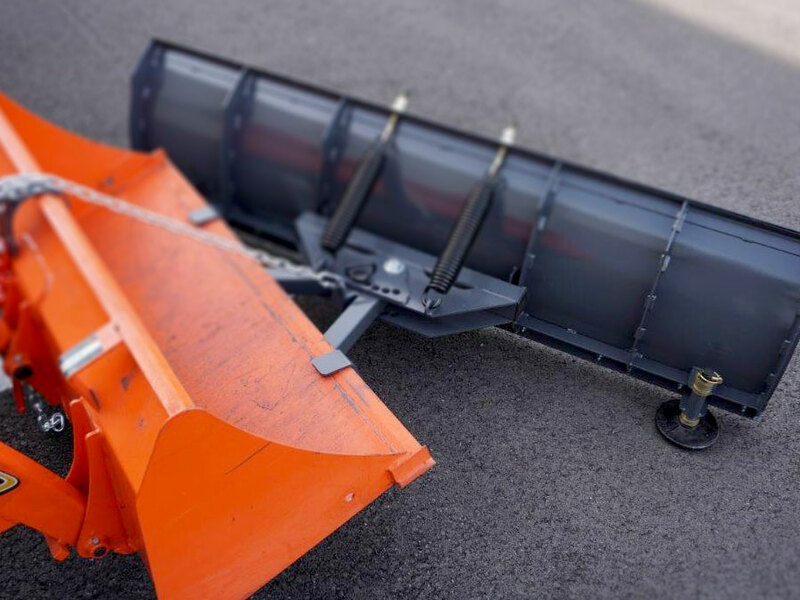 I am somewhat mechanical and have had snow plows before so I am familiar with how it functions and goes together. With that said, I found the instructions accompanying the plow to be of limited use.The first step said" Position the pivot plates mounting tabs in the spaces on the back of the moldboard. The tabs should be on the "down" side". What the world does that mean? No photos no drawings, just text. it gets no better after that. It took me about 3 hours to figure out how it went together and how it attached to the tractor bucket. My wife found a youtube video that helped, but it was not on the BXpanded website. You guys could do so much better! I also purchased the skids for the plow, no mention of how they go on, but it is self explanatory, and nothing about adjusting the plow height. The instructions also did not mention the wear bar which goes on the bottom of the plow. again self explanatory to me, but for a novice maybe not. I will add or re-review after I use the plow for the first time. I am sure it will work just fine, but I will let you know. IF the plow works as it is advertised, I will upgrade my rating to 5 stars. Update 1/7/2019: My snow plow arrived in October, I had some issues installing it which I covered in a previous review. Now I have used the plow on snow, and it worked really well. Our first decent snow of the year was preceded and by a significant amount of rain, and then it got below freezing which really made a mess of my driveway. Needless to say it was a heavy wet snow. The plow worked great! It moved around in the bucket a little, but I should be able to do a better job tightening it up to the bucket. I am very happy with my purchase, 5 stars!! I ordered the 60 inch plow for my Kubota B2320 in December. I have used it twice, and have had no problems at all with it- does a really nice job. The only suggestion I could make is that the assembly instructions be a little clearer. I was ok as I have Boss on my pickup, so I am familiar with plows, but could see how someone might not understand them. However, the plow is of great quality, and would definitely recommend it !! 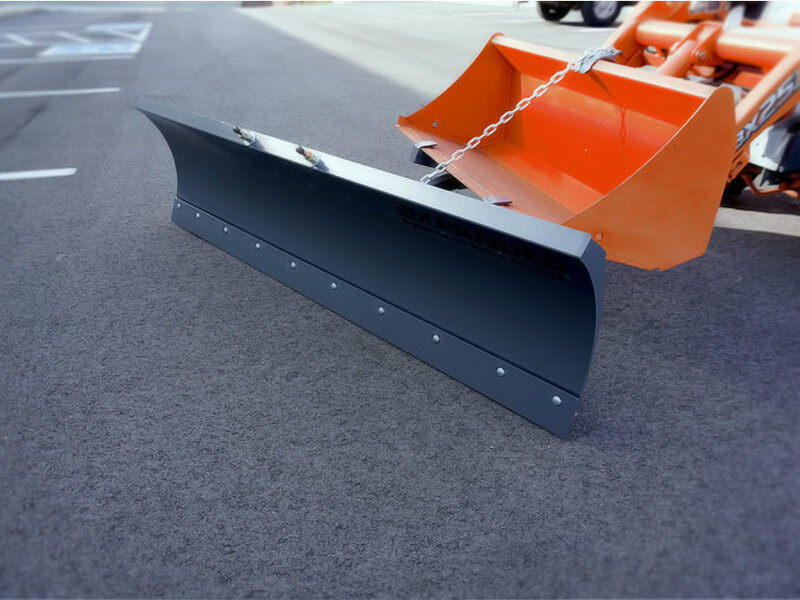 ordered 60inch plow 1/16/18 was delivered 1/19/18 well made and complete. used once for a 6 inch dusting much better than my 60inch back blade fast and easy.waiting for 4 to 8 tomorrow night to learn how to use it properly. Q: What size grab hook do I need for the chain? A: No additional hook needed. 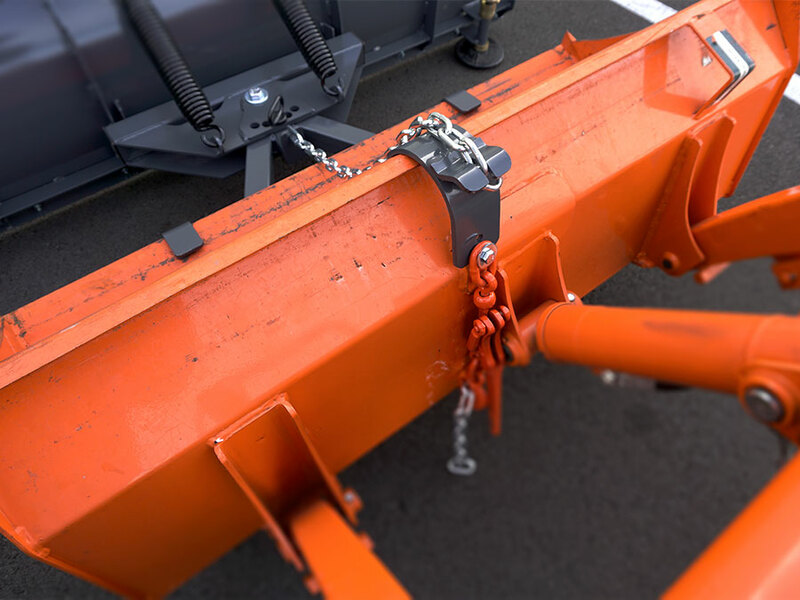 Everything necessary to mount to your loader bucket is supplied. Q: What is the weight of the blade? 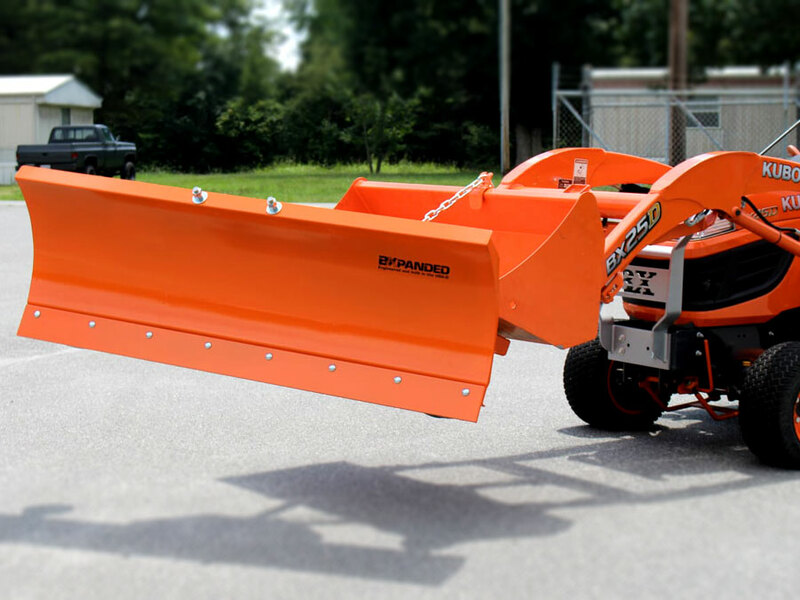 A: The 60" blade weighs approximately 215 lbs. The 72" weighs about 235 lbs. Q: Is there any way to hook up some sort of hydraulics for the angling of the blade? A: Currently we do not have a way to do this but check back with us in the future!